Key difference: Aims are what you want to achieve, while, objectives are what you will do to achieve them. An objective is more specific in character, while an aim is more abstract. Also, an objective is time-bound whereas an aim need not be. There is a lot of confusion over the difference between these words. Many consider aims and objective to be synonyms, however, that is not the case. Aim: Aim is setting a determined course in order to achieve a set target. Aims are usually long term. Ex: The person aims to acquire the required doctorate to become a doctor. 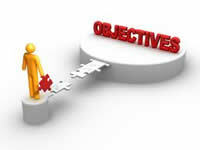 Objective: An objective is a more specific target set in order to achieve the goal. It must usually be completed in a particular time limit. Ex: The person should begin his doctorate studies by next year. 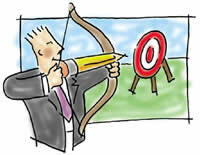 The main difference between aims and objectives is that an objective is generally more specific as compared to an aim. An aim can be slightly vague. It can be a general statement. However, an objective must be as specific as it can be. For example, an aim for a company would be to increase sales. However, an objective would be to increase sales by 10% within the next financial year. Thus is can be said that an objective is SMART in character. “SMART” stands for specification, measurement, accuracy, reason and time. However, an aim need not fit all these categories. So in summary: Aims are what you want to achieve, while, objectives are what you will do to achieve them. An objective is more specific in character, while an aim is more abstract. Also, an objective is time-bound whereas an aim need not be. It is to the simplest terms that now I can become knowledgeable. So far, this the best explanation I've come across. Thanks. to be more precise aim is the 'direction' of the journey and objective the 'route' of the journey. aim is also commonly called as 'goal'. an aim becomes an objective when you constraint it with a 'time limit' and 'quantity limit'. for example: cost reduction is an goal/ objective. however reducing cost 'by 2% in the next one year' is an objective (here the 'time limit' is one year and the 'quantity limit is 2%). to go step a further what all you will do to achieve the objective are called strategies. for example, here, you may reduce cost by reducing wastage, improving productivity etc. all of which will be your strategies to achieve the objective. to recap the hierarchy 'aim' becomes 'objectives' which are achieved through 'strategies'. Thanks a lot sir , for sharing such knowledge. This is great, so simple and yet so helpful. Thanks a bunch. Thanks a million. This really help. ive gotten what i want in full thanks.